A few weeks ago Nelson-Jameson attended a Vendor Expo put on by one of our customers. There we were able to sit and talk directly with key Sanitation personnel from all of their facilities around the world, as well as show them some of our latest and greatest products. A large part of the evening was spent listening to customer requests, obstacles and victories. In some cases, we had the new products they were looking for right at our booth, and in other cases we had to get back to them with details. By listening to our customers we are able to become more in tuned with the needs of the industry and challenges our customers are facing. We then take that feedback to our manufacturing partners to find product that meets the need and offer a solution. We also are able to find out what is working well with our customers. Which products have been found to perform well in certain applications, and if product that is designed for this application is being used successfully in that application. Staying in touch with our customers and listening to the challenges they face allows us to continue to provide solutions needed in the food processing industry. In the end, the best source of knowledge about a product is from the people who are actually using them on a daily basis. It might surprise some of our customers, but there is A LOT going on behind the scenes here at Nelson-Jameson. One of the areas that has been hopping lately is the marketing department…where we have recently finished or are in the process of finishing five promotions, as well as kicking off working on the new 2011-2012 Buyers Guide. 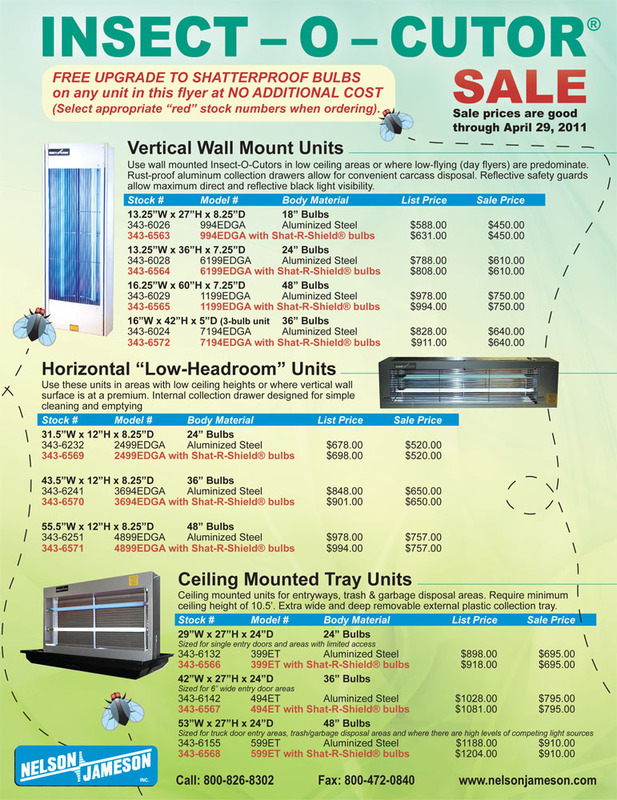 Soon many of our customers will be receiving our Insect-O-Cutor® Sale Flyer, updated Color-Coded Specialty Catalog and New Products Catalog (NPC). We have also recently sent out our Sanitation Basics Sale Flyer and Nilfisk Industrial Vacuums Flyer. Now I know many of you are saying that we are breaking a cardinal rule of marketing: don’t send your customers too much at once! It is true we try to follow that rule, but there is just so much happening and so many deals that we want to share with our customers. For example, our Insect-O-Cutor® flyer is offering a free upgrade to shatterproof bulbs on any unit on the flyer, which offers a HUGE savings. And our Color-Coded features four pages of additional products, many of which are the orange items our customers were requesting. 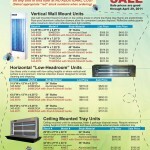 Our NPC Flyer showcases all the new products we have added since our last Buyers Guide. If you are interested in any of these new flyers, you can check out our website or give us a call (800-826-8302). Also, watch our blog for updates about the creation of our new 2011-2012 Buyers Guide. The process takes six months, but the final product is always worth it!